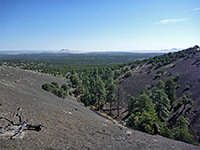 The San Francisco Volcanic Field north of Flagstaff contains several hundred cinder cones and other volcanic relics, centered on the San Francisco Peaks with rise to 12,633 feet. 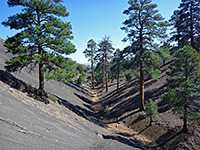 Some are found within the small Sunset Crater Volcano National Monument, while most of the others are on USFS land, part of Coconino National Forest. One quite well-known location is Red Mountain, a thousand foot high cinder cone which is unusual in outline, being U-shaped (when viewed from above) rather than circular, with the opening angled westwards. The western slopes are conventional in appearance, formed of smooth black ash, partly wooded, but much more spectacular is the northeast side, as this has been eroded into a curving amphitheater lined by corrugated cliffs and filled with pinnacles, ridges and narrow gullies. 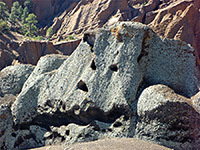 The rocks (cinders, ash and lava) are mostly a rich reddish-brown color, though some scattered outcrops are black or grey, and all contrast with the bright green vegetation around the perimeter and between some of the formations, creating a very photogenic scene. The amphitheater is the section reached by the approach trail, a gentle, 1.5 mile route across fairly level, sparsely forested terrain, starting at a large, well signed trailhead along US 180. The eroded formations extend about 700 feet though many parts are steep and inaccessible, and it doesn't take long to explore all of the easily-reached areas, but there is still enough to see for several hours. 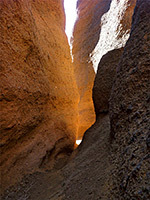 The formations are best viewed in morning or the middle of the day, as they become in shadow later in the afternoon. All the surrounding land is part of the national forest and is completely undeveloped, with many places suitable for primitive camping. The denser woodland around the base of the peak is also a good birding habitat. The turn for Red Mountain along US 180 is 31 miles north of Flagstaff and 18 miles east of the AZ 64 junction. There is a big parking area beside the highway, used during wet/snowy weather, and by larger vehicles, while a 0.3 mile track - bumpy and rutted when wet - leads west to the actual trailhead. En route the track passes a cleared area partly enclosed by bushes and out-of-sight of the highway, a possible camping spot. 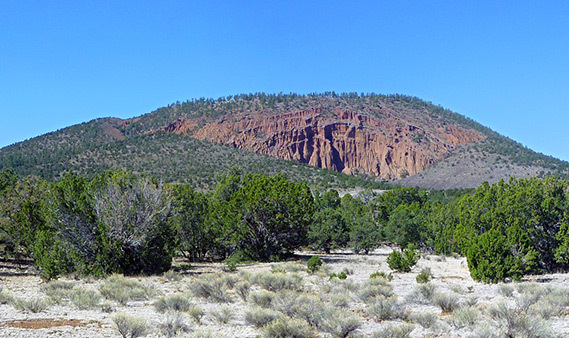 The vegetation at this relatively high elevation (7,200 feet) is a typical mix of pinyon-juniper pines, grass and sagebrush, plus limited wildflowers, and the land is mostly flat, allowing views across the plains towards several other peaks, all to the south, as to the north the land is empty of landmarks, sloping down towards the Painted Desert. The Red Mountain Trail is 1.5 miles long, heading west from the parking area over reddish earth, sparsely vegetated. It passes over a little ridge and across a more open area, giving good views of the low peak ahead. Beyond, the surroundings are more wooded and the upwards gradient increases slightly, until the last section, where the path drops into a dry, sheltered, gravelly wash, home to some larger ponderosa pines. The drainage becomes a little deeper and V-shaped in profile, running between big slopes of black ash, and meets the lower edge of the amphitheater, which is marked by a short series of steps over a stone check dam. The trail ends just beyond in a wooded clearing in the middle of the formations, leaving hikers free to explore, though a notice warns against going very far in order to avoid damaging the formations, and because of the steep, sometimes unstable slopes. 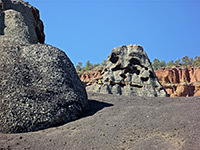 The largest hoodoos are found towards the south side of the amphitheater, formed of reddish ash topped by harder lava caprocks, mixed with other pinnacles made entirely of the ash, and a variety of other undulating formations. There are several very short narrow ravines hereabouts, the largest gaining height via two dryfalls (perhaps climbable using logs left in place), ending in an enclosed chamber containing a big round boulder. 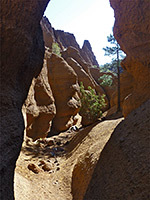 The central section of the bowl is more wooded and open, with generally smaller, more rounded hoodoos, while towards the north is a larger ravine - the main drainage channel - which is briefly narrow, before dividing and rising steeply. Many more formations are high above, arranged in curving layers, up to the high point of 7,965 feet. From the summit, the rim slopes down on both sides, extending to two ridges which curve round towards the mouth of the amphitheater, and provide possible routes for climbing up - although some areas are unstable, formed of loose, steep ash, other parts of the hillside are rocky, firm and rough in texture, providing good traction. Around the summit, where more angular red formations mix with greyish outcrops and many trees would seem perhaps to be even more picturesque than the basin itself, though much more effort would be required to get here. But just a short climb up the lower end of the northernmost ridge reaches some scattered formations of coarse-grained grey rock (cemented cinders), which have been eroded into strange cavities, and are surrounded by contrasting, fine-grained ash.